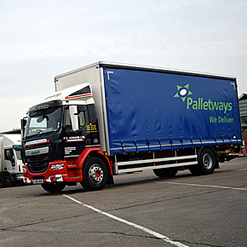 Pallet freight delivery services throughout Europe with numerous options and easy booking through PC Howard Ltd.
Book a delivery to Europe!! Booking small consignment deliveries to Europe through PC Howard couldn't be easier. The system for booking a pallet for collection from or delivery to Europe is the same within as within the UK , you simple go on to the system and enter the Country and the address – a label is generated and placed on the pallet – it is then on its way! The only difference is the time that it takes to deliver a pallet , we have a Service map for Europe which gives the number of days that it will take to achieve the quickest delivery to any area – this is the premium service. As with the UK the Economy service is takes as its base the time to deliver for a premium service and then adds on 2 or 3 days to give more flexibility in the delivery process and of course a lower delivery cost for the customer.